AIPAC calls to fix shortcomings of Iran nuclear deal after Trump pulls out. The American Israel Public Affairs Committee (AIPAC) reacted on Tuesday to U.S. President Donald Trump’s announcement that he was leaving the nuclear deal and would reimpose sanctions on Iran. “Iran must never acquire a nuclear weapons capability. AIPAC has long worked with Democrats and Republicans in Congress and with administrations of both parties to thwart Iran’s nuclear ambitions. Given the combination of a critically flawed 2015 nuclear deal with Iran and the international community’s inability so far to adequately address these shortcomings, we believe the administration’s decision today provides an important opportunity to address the shortcomings of the deal and to confront Iran’s escalating regional aggression,” it said in a statement. “We recognize that there are significant differences over this decision. AIPAC remains committed to working with Congress and the administration in a bipartisan fashion to forge policies that will ensure Iran can never acquire a nuclear weapons capability or realize its dangerous regional ambitions,” concluded AIPAC. Earlier on Tuesday, Trump called the 2015 Iran deal an "embarrassment" that "should never have been reached." "After the sanctions were lifted, the dictatorship used its new funds to build nuclear capable missiles, support terrorism, and cause havoc throughout the Middle East and beyond," he said. Trump cited Prime Minister Binyamin Netanyahu's presentation of Iran's nuclear archive last week as proof that Iran cannot be trusted to abide by its commitments under the JCPOA or to abandon its desire to develop nuclear weapons. 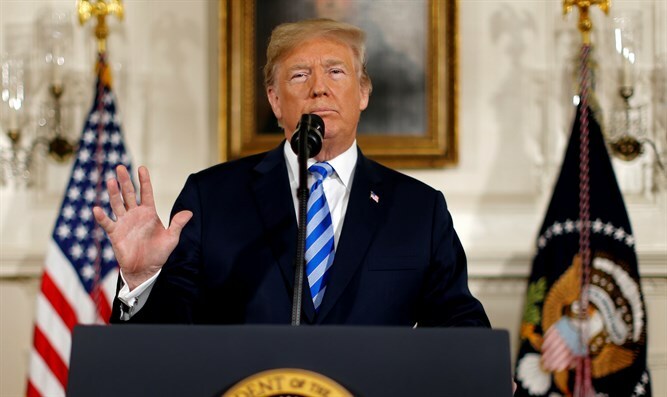 "Last week, Israel published intelligence documents long concealed by Iran conclusively showing the Iranian regime and its history of pursuing nuclear weapons," said the President, adding that the U.S. would reinstate sanctions on Iran. "We will be instituting the highest level of nuclear sanctions." "We will not allow American citizens to be threatened with destruction, and we will not allow a regime that chants 'death to America' to gain access to the most deadly weapons on Earth," he stressed. “Israel has opposed the nuclear deal from the start because we said that rather than blocking Iran’s path to a bomb, the deal actually paved Iran’s path to an entire arsenal of nuclear bombs, and this within a few years’ time. The removal of sanctions under the deal has already produced disastrous results. The deal didn’t push war further away, it actually brought it closer. The deal didn’t reduce Iran’s aggression, it dramatically increased it, and we see this across the entire Middle East. Since the deal, we’ve seen Iran’s aggression grow every day- in Iraq, in Lebanon, in Yemen, in Gaza, and most of all, in Syria, where Iran is trying to establish military bases from which to attack Israel,” he added.